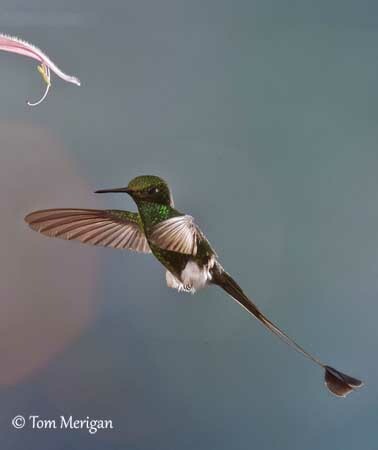 The bird’s description is included in the name: a hummingbird with boots and “racquets” at tail tip! The Booted Racket-tail adult male has shining green upperparts and underparts, with glittering green throat and breast. The flight feathers are greyish-bronze. The tail is deeply forked with elongated outer rectrices, ending in bare shafts and blue-black racquets. The head is shining green with bronzy forehead and white postocular spot. The black bill is short (13 mm) and straight. The eyes are dark brown. The leg puffs are white. The female has green upperparts. The underparts are white with green spots on the body sides. The tail is much shorter than in male and lacks the racquets. The central feathers are green, whereas the outer rectrices are dark blue and tipped white. The leg puffs are white or buff. On the head, the postocular spot is white too, and she has white malar stripe and narrow blackish moustachial streak. The immature resembles adult female, with edged buff head feathers. We can find 8 subspecies which slightly differ in tones of green, tail size in males, and white or rufous leg puffs. 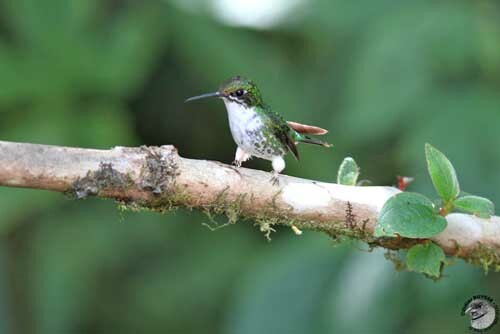 Females differ in extent of green spots on the underparts and white or rufous leg puffs. The Booted Racket-tail utters weak twittering when feeding. 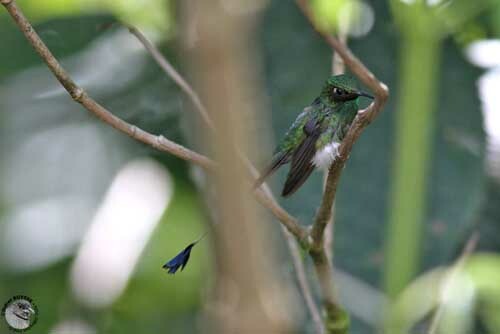 The Booted Racket-tail is found in wet forest in subtropical and temperate Andean regions. It occurs within the forest and in open secondary growth. 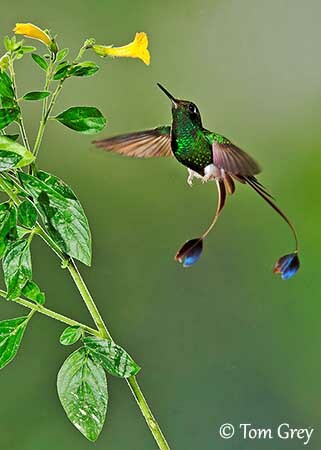 The Booted Racket-tail is found in the Andean mountains in Bolivia, Colombia, Ecuador, Peru and Venezuela. 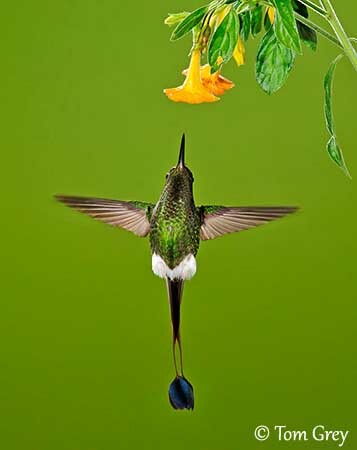 The Booted Racket-tail feeds on nectar from several flowers’ species. It also catches insects by hawking while flying. It hovers, and may occasionally cling to blossoms. It feeds from the upper undergrowth to the canopy, from 6 to 18 metres above the ground. 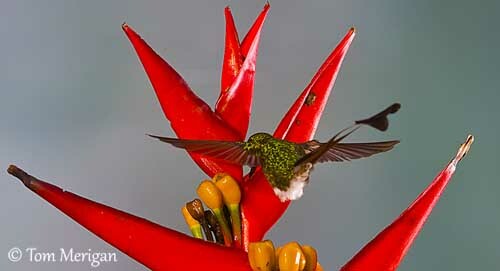 It feeds alone at low level inside the forest, but often with other hummingbirds at canopy of flowering trees. 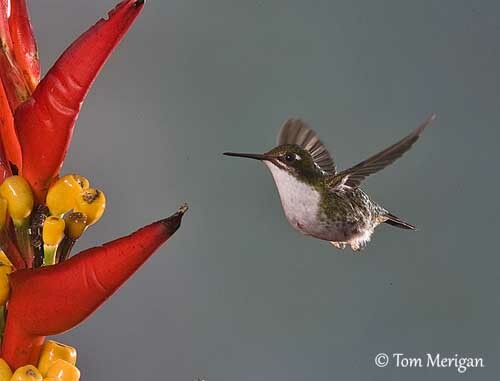 The Booted Racket-tail favours the red tubular-shaped flowers with high sugar content. It uses the long, extendible tongue to reach the nectar while hovering. As it is taking the nectar, its tail is cocked upwards several times per second. During the breeding season, small spiders and insects provide good sources of proteins. The feeding territories are established and strongly defended by males. They chase away from the area the other males and also the large insects. The defence displays include aerial flights and intimidating postures. 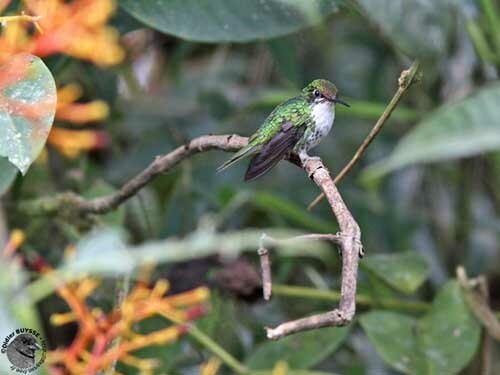 As other Trochilidae species, the Booted Racket-tail saves the energy at night by going into a state of torpor during which the temperature drops down and the heart rate slows down. During the breeding season, the male performs flight-displays in front of the female, following a U-shaped pattern which enhances the long tail feathers. The male leaves the female after the copulation. This species performs some post-breeding altitudinal movements. 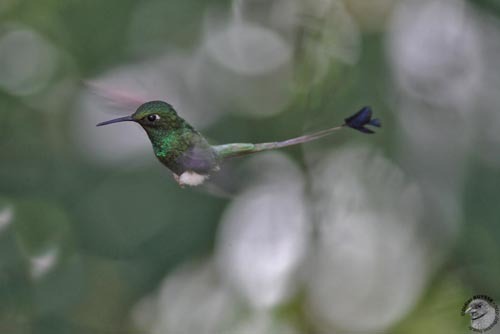 As other Trochilidae species, the Booted Racket-tail is able to hover in all directions and flies easily in spite of the long tail. The breeding season is probably extended throughout the year according to the range. The female chooses the nest-site and builds the nest. This is a tiny cup-shaped nest, made with plant fibres and lichens for camouflage. The inner cup is lined with softer plant fibres and animal hair and down. The structure is strengthened with spider webs. Such nest is placed on horizontal twigs in tree, at about 6-8 metres above the ground. The female lays two white eggs, and incubates 16-17 days, while the male defends the territory and the feeding areas. The chicks are dark with some blackish down on the back. They are fed by regurgitation by the female. They fledge about 19-22 days after hatching. 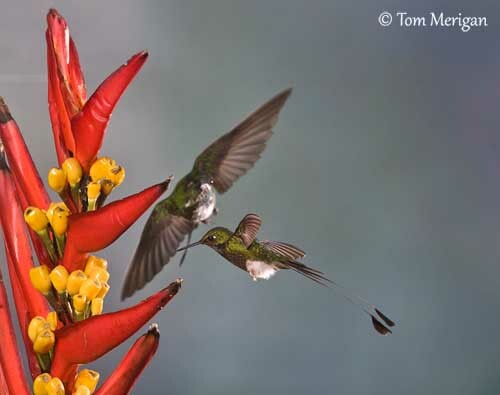 The Booted Racket-tail feeds mainly on nectar from red tubular flowers of several plant species. 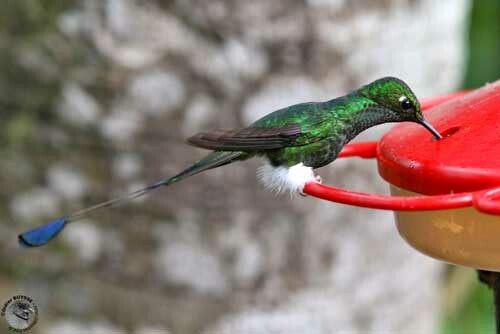 It also takes insects and small spiders, and may visit local feeders where it consumes sugar water. 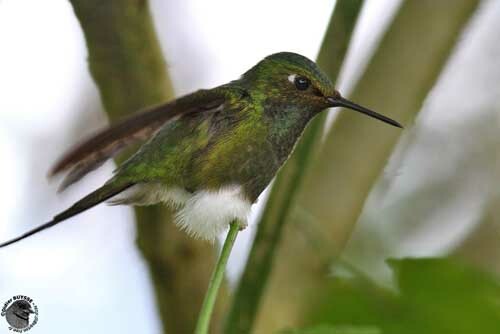 The Booted Racket-tail is very common in montane forest, and occurs in several protected areas, national parks and nature reserves. This species is not currently threatened.